Can the Red Sox Win the World Series This Year? So after all the angst and all the moaning, the 2017 Boston Red Sox ended up pretty much where we expected prior to the start of the season. There were bumps along the way, but the Sox wound up winning 93 games, which was in the general neighborhood of many predictions, and took the American League East for the second year in a row. So while it’s true that there are reasons for worry tonight as the Sox open their playoff run against the slugging Houston Astros, there are reasons for optimism, too. Let’s start with the glass half empty and acknowledge the legitimate concerns about this team’s offense. Only three clubs in Major League Baseball hit fewer home runs than the Sox, who finished the season with just 168. Mookie Betts led the team in homers with the modest total of 24. Another way to think of the Red Sox offensive struggles is to consider run differential, which is the total number of runs a team scores subtracted by the total number it gives up. Run differential turns out to be a useful measure of overall team performance — the top nine major league teams in run differential all made the playoffs. (The tenth playoff team, the Minnesota Twins, placed twelfth in the category.) Given that the Red Sox allowed the fifth-fewest runs in the majors, it is something of a disappointment that the team placed eighth in run differential. Which is not to say that the Red Sox red flags are limited to hitting. 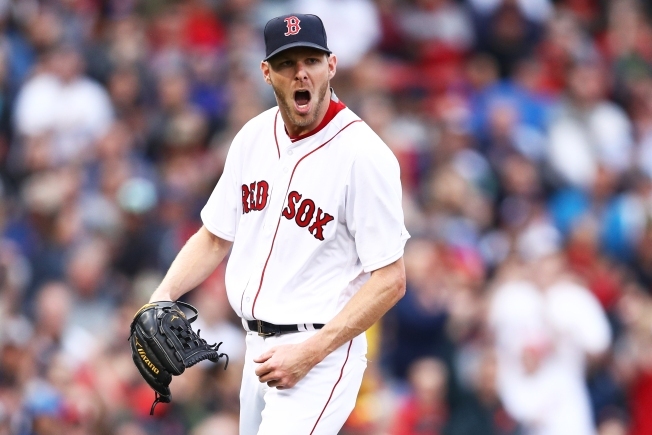 At various times during the stretch run, Chris Sale and Drew Pomeranz have looked hittable. Rick Porcello, meanwhile, has turned in one of the poorest year-after-a-Cy-Young seasons in memory. David Price made just 11 starts this season, and will be restricted to a bullpen role during the playoffs. So how does the optimist find anything of promise in what lies ahead for the Red Sox during this postseason? He may have experienced a few hiccups in September, but as long as Sale is healthy, he gives the Sox a change in any series. Then there’s Pomeranz, whose 2017 performance has converted this extreme skeptic of the deal that brought him to Boston. He has had a spectacular season, and what he makes up for in inability to go deep into games, he more than makes up for with stuff that at times is nearly unhittable. Another cause for hope has been the season-long performance of the bullpen. Sox relievers posted the second-lowest ERA in all of baseball this year, anchored by a performance for the ages by closer Craig Kimbrel, who struck out more than 16 batters per nine innings and placed second in reliever WAR. But it’s not just Kimbrel who inspires confidence. Late-season acquisition Addison Reed has provided stability in an eighth-inning role that had bedeviled the Sox prior to his arrival, and Carson Smith, throwing at last for the team after losing more than a year and a half to injury, has looked nasty over the past two weeks. And finally there is Price, who has emerged as a possible bullpen weapon for the Sox capable of being used situationally or of pitching multiple innings. If the Sox can get a lead, they have the kind of pitching talent and depth capable of holding onto it. And while we’re taking count of Sox assets, let’s not forget entirely about that offense. Despite the lack of power, and notwithstanding the unspectacular run differential, the Sox bats are hardly anemic. They may not hit the ball out of the park with great frequency, but they did manage to place tenth in the majors in runs scored. Meanwhile, Devers, at just 20 years old and playing as a rookie, has significantly improved the team’s attack in his 58 games. And if Nunez is healthy — a big if — the team’s offense might look downright professional. Most of all, though, there is the hustle and spirit of this young team. The Sox had 10 walk-off wins this year, and went an astonishing 15-3 in extra inning games. There’s some luck baked into small sample results like that, but there is also resilience and toughness. It is through the churn and tumult of a season like this one that a team finds its identity. It’s how championship character is developed. Is a championship in the works for the Red Sox this year? There are reasons to doubt it. But I wouldn’t bet against it, either.